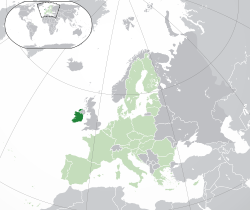 英文版宪法：The name of the State is Éire, or, in the English language, Ireland. 爱尔兰文版宪法：Éire is ainm don Stát nó, sa Sacs-Bhéarla, Ireland. ^ Census of Population 2011: Preliminary Results (PDF): 1. 30 June 2011 [29 August 2010]. ^ Official Languages Act 2003. Office of the Attorney General. [18 February 2012]. ^ Ireland. CIA World Factbook. Central Intelligence Agency. [28 August 2011]. ^ CSO 2011 Census – Volume 5 – Ethnic or Cultural Background (including the Irish Traveller Community) (PDF). 2011 [9 July 2009]. ^ 5.0 5.1 5.2 5.3 Ireland. World Economic Outlook Database. International Monetary Fund (IMF). October 2016 [2016-12-25]. ^ Government of Ireland. Article 2. Republic of Ireland Act, 1948. Dublin: Government of Ireland. 1948. It is hereby declared that the description of the State shall be the Republic of Ireland. ^ Official text of Ireland Act 1949 (PDF). [4 November 2011]. ^ November getaways. Ireland at the UN. Independent.ie. 22 August 2010 [12 November 2010]. ^ November getaways. Ireland's UN affairs. Independent.ie. 26 June 2010 [12 November 2010]. ^ Lally, Conor. Numbers in Defence Forces hit 40-year low. Irish Times. 25 November 2009 [12 November 2010]. ^ Climate in Ireland. Met.ie. [22 October 2009]. ^ The Ireland Climate and What to Wear. TravelInIreland.com. [22 October 2009]. 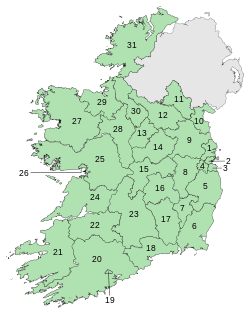 ^ Temperature in Ireland. Met.ie. [22 October 2009]. ^ Wind over Ireland. Met.ie. [22 October 2009]. ^ Local Government Reform Act 2014 (PDF). Environ.ie. [2 June 2014]. （原始内容 (PDF)存档于2015年9月24日）. ^ Mark Frary. Heathrow dominates top 20. The Times (London). 19 March 2007 [4 July 2007]. ^ Ash makes Ryanair cancel flights until Monday 互联网档案馆的存檔，存档日期2010-04-19.. Forbes. 16 April 2010. ^ WATS Scheduled Passengers Carried 53rd Edition. International Air Transport Association. 2008. ^ CSO – Central Statistics Office Ireland. Central Statistics Office Ireland. 9 November 2004 [9 July 2009]. ^ Fottrell, Quentin. Ireland Officially Exits Recession. Wall Street Journal (Online.wsj.com). 30 June 2010 [30 June 2011]. ^ Ireland to receive €85 billion bailout at 5.8% interest rate. Irishtimes.com. 28 November 2010 [30 June 2011]. ^ Contemporary Music Ireland. Contemporary Music Centre – Links. [9 July 2009]. （原始内容存档于2009年2月24日）. ^ Traditional Irish Cuisine. [19 January 2011]. （原始内容存档于2012-08-01）. Gilland, Karin. Ireland: Neutrality and the International Use of Force. Routledge. 2001. ISBN 0-415-21804-7. Greenwood, Margaret. Rough guide to Ireland. Rough Guides. 2003. ISBN 1-84353-059-7. Mangan, James Clarence. 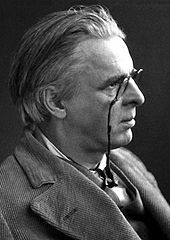 James Clarence Mangan – His Selected Poems. Read Books. 2007. ISBN 1-4086-2700-0. Meinardus, Otto Friedrich August. Two thousand years of Coptic Christianity. American Univ in Cairo Press. 2002. ISBN 977-424-757-4. Moody, Theodore William. A New History of Ireland: Prehistoric and early Ireland. Oxford University Press. 2005. ISBN 0-19-821737-4.